It’s February…and it’s time for another cocktail night! We’re scaling back a wee bit and mixing up two drinks, rather than our usual three, to give more attention to our chosen cocktails and allow everybody to sample the ingredients, not to mention some homemade limoncello. Well, OK, it’s also to give the bartender (me) a bit of a break. 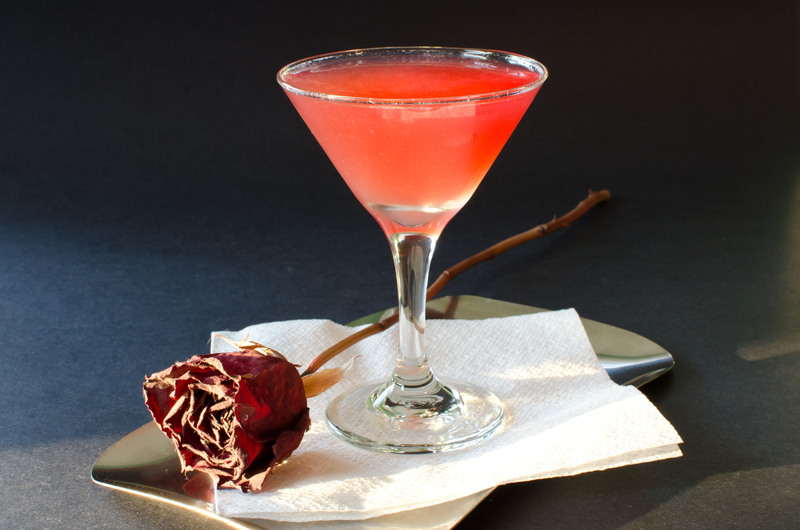 Though we had quite a few themes to pick from this month, Valentine’s Day is this week — a bit cheesy, I know, but c’mon — and we were hoping to try out a new ingredient for the club, so we’ll be doing a couple of “Pink Drinks” that feature apple brandy. No Cosmopolitans here! (though it’s a good drink when made right) Instead, we’ll be mixing up a couple of old-school classics, the Jack Rose and what we’ll be calling the Secret Cocktail (Ooooo). The Jack Rose, as you know from a previous post, is simply wonderful: tart, bracing, and a simple-to-construct-yet-nicely-different sour-style cocktail. Oh, and the color is fantastic…sort of a bright, fuchsia-tinged red. The Secret Cocktail is a light, pretty, rosy pink — “very fetching,” says Ted Haigh — and velvety smooth, with a white foam on top. Despite the similarity of the ingredients, the drinks offer completely different experiences. The Secert Cocktail’s base is actually gin (we’ll be using Plymouth) with the apple brandy providing more of an accent. Together, the drinks form a “Perfect Pair,” a nice red-hued couple in celebration of Valentine’s Day. Shake with ice and strain into a cocktail glass. Garnish with a lemon or lime wheel, if you like. Adapted from the PDT Cocktail Book. Though I’ve covered the Jack Rose in the past, I neglected to provide any links for further information. For a lively write-up that quotes David Embury — probably the guy who was responsible for cocktail historians re-discovering the drink — head over to SLOSHED! Dave Stolte also has a nice little summary, prefers his with lime, and shows off a grenadine formulation…and yes, the Jack Rose is my preferred alternative to the dreaded Appletini, as well. For a variation, check out Chuck Taggart’s Jacques Rose Cocktail No. 1 & 2, in which he Frenchifies the drink by adding Peychaud’s bitters (I’ve tried this in both the Jack Rose and our Secert Cocktail, and it works wonders, but increased the citric tartness a bit more). Shake without ice, then add ice and shake. Strain into a cocktail glass, large coupe, or small wine glass (7 ounces or so with the foam). Garnish with a cherry, if you wish. 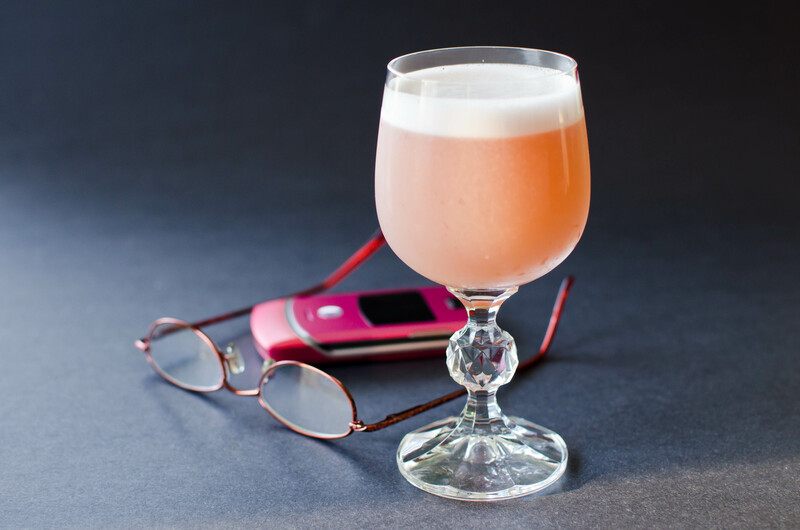 Ted Haigh, author of Vintage Spirits & Forgotten Cocktails, maintains that there are two things about this pink cocktail that “scare people to death:” it’s name and the fact that it contains egg whites. It’s a bit of comical exaggeration on his part: the name’s not scandalous, trust me, and you have little to fear from egg whites in drinks (the odds of salmonella occupying Egg Street are extremely low; plus, the whites add no flavor whatsoever, just texture). The cocktail itself is related to the Clover Club, which was created in the early 1900s at the Bellevue-Stanford Hotel in Philadelphia and named for a nearby men’s club. 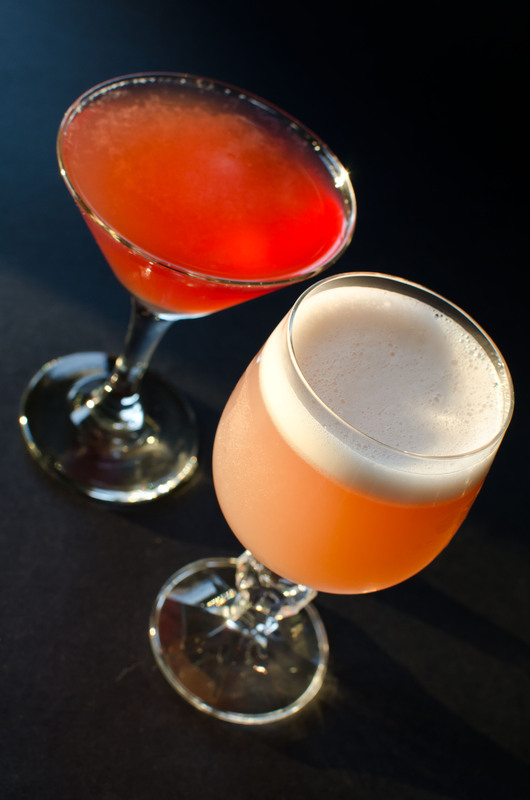 The two drinks are identical except for the addition of apple brandy, which the Clover Club omits. 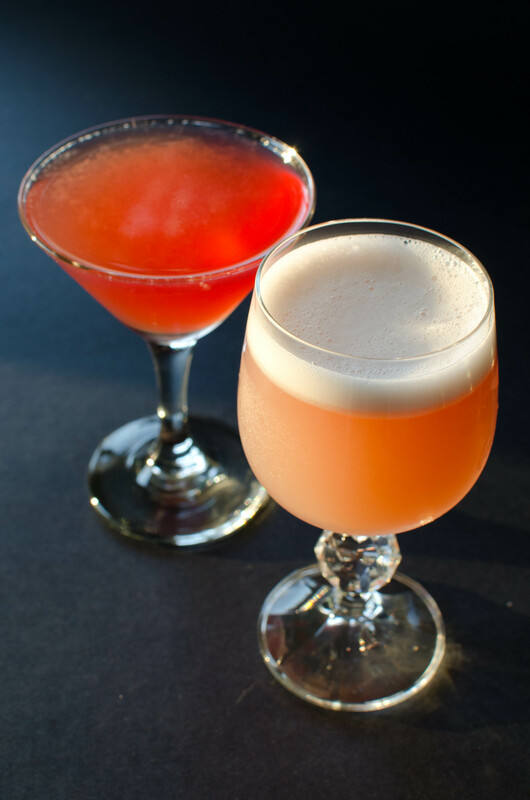 The Clover is perfectly fine on its own, but its sister cocktail is much more interesting, the apple brandy adding just the right amount of punch to cut through the foamy texture while adding a fruity backbone to the sweet-and-tart grenadine. The gin is providing more a subtle base to be modified — I think its interaction with the lemon counteracts the sweetness of the grenadine and apple brandy. Try out different gins if you wish (perhaps an American Dry), but I find that Jim Meehan’s suggestion of Plymouth is just about perfect. If you’d like a less sweetness, cut back on the simple syrup or eliminate it entirely. Meehan credits the drink to Harry McElhone’s ABC of Mixing Cocktails from 1922. HERE BE SPOILERS: Look at these links and you’ll know the true name of the drink! Also, we have some nice write-ups from Summit Sips and the ladies at LUPEC Boston. Some other recipes out there (About.com’s) substitute cream for the egg whites, and I’ve even seen a number that use vodka in lieu of gin. Both ingredient swaps are probably the result of the post-Prohibition cocktail meltdown, cream being safer than eggs and vodka being more innocuous and acceptable than gin. The apple brandy is also omitted in newer recipes, but don’t miss out: use the original! I will note, however, that Wikipedia has quite a bit of history posted for this particular drink. Let me sum up: it likely comes from the early 20th Century, the cream was added to the drink in New Orleans and it was dubbed the “Pink Shimmy,” and Esquire once named it one of the worst ten drinks in existence. Us guys didn’t know what we were missing. This entry was posted on February 10, 2012 by IJ Lauer in Apple Brandy, Drink Recipe, Gin, Grenadine, Heron Social Club, Lemon Juice and tagged apple brandy, applejack, cocktail night, drink, egg white, gin, grenadine, jack rose, lemon, pink lady, recipe, secret cocktail.